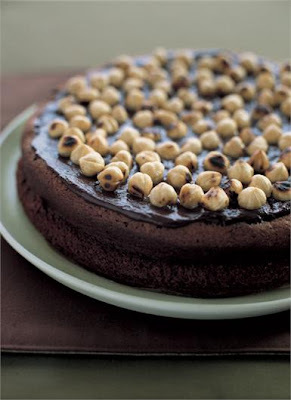 This is Nigella Lawson's Nutella Cake. Looks good. Which is why I thought it would be a perfect 29th birthday celebration cake for little old me. This is Rahul's Nutella Cake. Now call me biased, but I think it's pretty darn perfect, possibly even better than Nigella's because the hazelnuts aren't roasted to the point of being black and charred. Plus Rahul was forced to work with a less than even amateur stylist taking photos as she rushed out the door at 7.12am. Plus it was Rahul's first attempt at baking. Ever. Okay so I haven't tried the finished product just yet, it being only 6.27pm on birthday night. But the batter was amazing. And I couldn't wait to show off Rahul's newly discovered talent! Rahul you star! Well done! wow!!! looks delicious... happy belated birthday!!! the recipe looks great, it's in how to be a domestic goddess isnt it?